When I thought about this ‘April daily photo’ idea I intended that each photo would either stand on its own or have a short paragraph of text to accompany it. Having now gone through the available photos from the archives from the month of April in years past I can see that a few of the images I intend to include might need accompanying text of a slightly longer length. This is one of them. Today’s image isn’t an attractive photo: it’s clearly just a building site. A building site at 4 Fishergate, opposite the Fishergate end of Piccadilly, where the Fishergate Centre used to be. 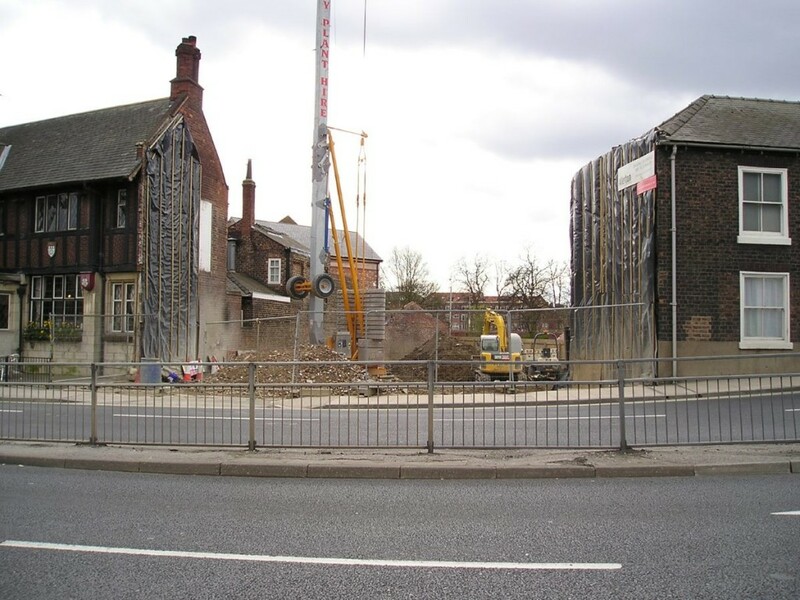 In April 2008 that had been demolished to make way for the Peasholme Centre, or rather, the new replacement Peasholme Centre. The original one had been in Peasholme Green, hence the name. On 4 April 2008 I took quite a few photos on a wander through York, including some pleasing ones of St Denys’s church on Walmgate, with beautiful light coming in through the windows. But it seems more fitting today to focus on this photo instead. The Peasholme Centre is a hostel for people who are homeless. Or, more specifically, a resettlement centre for single homeless people or couples without children. The building was completed and opened the following year, 2009. I’ve been walking around York for years, don’t recall ever before seeing so many people sleeping in shop doorways. The main reason I use Twitter is because I find it’s an excellent source of information on things I’m interested in and care about. And via Twitter I think I’m fairly well-informed on ‘the state we’re in’ here in the UK, in our towns and cities. It’s clear that things are quite grim, that there’s a deepening division between those with lots of money and those with very little. That the vulnerable in society are in dire distress, over and over. And that while many of us are worrying about the property ladder, some people will never be anywhere near even reaching for that ladder. And that there’s still a lot of misunderstanding and ignorance about why some of us end up sleeping in a doorway while others can spend a night drinking cocktails at £7.50 a time and thinking that’s ‘reasonably priced’. And in York that division is becoming so deep that I felt I had to comment on it, and it’s something I’ll probably return to, because I can’t ignore it. And haven’t. See ‘related’, below. This page from December 2014 is particularly relevant, and includes Shed Seven, whose gig in support of SASH and the Arc Light Centre sold out today, within a couple of hours of tickets going on sale. I hope the proceeds help the good work of those charities. I hope the Peasholme Centre helps those who have a room there. I don’t know how we help the people in the doorways. Not under this government, which seems callous in the extreme. I try to avoid being overtly political on these pages, but I think I’m old enough and wise enough to recognise that. I have visited The new Peaseholme Centre as we have with clothing collections for there. I think the Centre does a wonderful job and it is a good addition to York’s facilities. Thanks Graeme, good to read these positive comments about the Peasholme Centre, and to know that other organisations and groups are helping to support it. I know that you don’t want to turn this into a political blog and you don’t have to as the facts, to anyone who walks around with their eyes open, are plain to see. Personally, I don’t have to worry about being homeless anymore but it does illustrate a good point: I was fortunate to escape the cycle because of good fortune, luck or whatever you’d like to call it but there are so many out there who are not as fortunate. We can carry on ignoring them, abusing them or pretending that it’s their own fault because they drink, smoke or fritter their money away while in the back of our minds, praying that it’ll never happen to us: but to some of us, it does. The general view of the homeless doesn’t bear resemblance to the truth. I’ve met men and women who became homeless due to family breakups; I’ve met a Bertie Bassett descendant with mental issues, who carried his inheritance in an old biscuit tin, under his jumper, strapped to his waist; I’ve met teenagers who left home to escape sexual abuse; I’ve met old men who’d been evicted because they couldn’t afford the rent: in short, I’ve met ordinary people who’ve fallen on hard times. We need to get away from this Victorian re-construction, propagated by the likes of Ian Duncan Smith and his rich mates of the deserving and the undeserving poor. I found your comment on this very powerful and very moving. Yes, you’re right, I try, as I said, to avoid being overtly political, because this website has many readers of different backgrounds and beliefs, and because I think that one of the reasons people like to visit here is because it’s usually calm and thoughtful and not a place full of politically charged fierce debate. I try to keep it that way by not writing angry rants. (Well, sometimes I write angry rants, but I usually leave them in draft form, unpublished, and write something more moderate later.) But many people with more experience and knowledge than me, like yourself, have seen a direct link between the increase in homelessness and government policy. You’ve said in your comment ‘I was fortunate to escape the cycle’. I was very fortunate, when I needed to leave home at sixteen, that I knew a very kind person who took me in, and just as important, a benefits system that supported me so that I could continue in education, right through to university. I wonder what would happen now to someone in a similar position. I can’t do much to make things better. But I will keep representing York as a place where many people live who don’t frequent its ever more expensive bars and restaurants and don’t benefit from the massive spend on its ‘cultural offer’.